Tube Doctor Amp Repair Seminar will be in Austin from Feb. 5th, to the 24th. The seminar is three days long. You can choose to take the Mon-Wed-Fri, or Tue-Thurs-Sat class. Click the calendar link to pick a class. This is an intense 3 day workshop where you bring your own amp and I bring a Fender and a Marshall amp and we go through them from the wall plug to the input jack using the course manual [see example below]. I bring my parts stock and if your amp isn’t working we’ll fix it during the class if possible. You’ll learn trouble shooting techniques used by the pros, how each section of the amp works and how to use test equipment. You’ll also learn how to bias an amp, and how to tell if the tubes are bad. Anyone can take the class and come out knowing more than they ever imagined. Safety is emphasized throughout the course. By the time you’re done, you’ll understand schematics well enough to do your own mods. The course manual is 25 pages packed with information and lots of graphics. This seminar is for anyone that wants to know more about tube amp electronics. Click on the calendar tab and pick a class and call me to confirm at 512 280 1442. ANY QUESTIONS CALL 512 280 1442. Directions to the location will be posted on the directions link on this page the last week of January and I will call you to confirm and give you the directions. Payment is at the door on the first night. The seminar cost is $200; which includes the manual and a lot of schematics and handouts. There are 4 people per class so call now to reserve the date and time you want. Tube Doctor Amp Repair repaired amps in Austin for 12 years and was a Fender, Mesa, Marshall, Ampeg warranty repair service center. I still do repairs here in Alpine Texas. TUBES RULE! Thanks, Scott. WALL OUTLET: Delivers 120 Volts AC, Single Phase to power cord plug. AC means alternating current. Alternating current forms a Sine wave [fig. 1] of 60 cycles [Hertz] and is called Line Voltage. The line voltage varies from place to place between 110 to 125 V. Austin’s is 117 to 120 V. Single Phase means only one wire is hot. In a two wire receptacle [outlet], the slot on the left is the Neutral and the white wire goes here. This wire goes to ground in the Breaker Box. The right slot is the Hot and the black wire goes here. This wire goes to the circuit breaker in the Breaker Box. On three wire receptacles the bottom hole is Ground, the green or bare wire goes here. The Ground wire goes to Earth, usually a 6ft iron rod driven in the ground, and to the Ground buss in the Breaker Box. The Hot wire [black] CAN KILL YOU, don’t touch it when it’s live. Use a meter or a line tester to check. A line tester is a little probe you can get at a hardware store; it will also tell you if all the wires are hooked up to the receptacle correctly. An incorrectly wired receptacle can damage the amp and CAN KILL YOU if the black [hot] wire goes to the wrong terminal. If the black went to the ground lug, you would	get a 120V shock by touching the chassis or anything plugged into it. On two slot receptacles the plug on the cord can be reversed and it CAN KILL YOU! Most of the time you get shocked not killed, but AC is EXTREAMLY DANGEROUS because the current alternates and you can’t let go if you are holding on to something hot. ALWAYS KEEP ONE HAND FREE WHEN PROBING OR TOUCHING ANYTHING HOT [turned on]. Keep one hand behind your back when probing an amplifier, receptacle, or breaker box. If the current flows through one hand and out the other, it goes straight through your heart, and it CAN KILL YOU. INSIDE THE AMPLIFIER [fig. 2]: The Power Cord connects the amplifier to the Wall Plug. 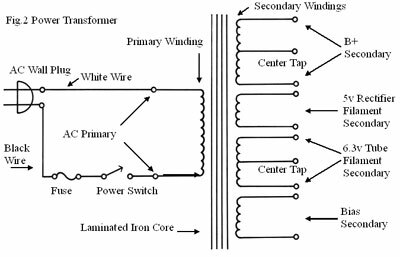 The white wire goes to the Power Transformer. The black wire goes to the fuse. The ground wire, if there is one, goes to the Chassis. The fuse is a wire that will melt at a certain current thus making an open circuit, and shutting down the amplifier. Fuses are rated by Current, [amperage], and Type, [slow blow, fast blow, time delay, ECT.]. Always use the correct current rating and type.